Haven't been spending much time on this clunky old school website, watch for a revamp soon! The big news for fall is: SHOWS. Appearing at New Forms Festival Friday October 7 with more special shows around the western states to be announced soon. 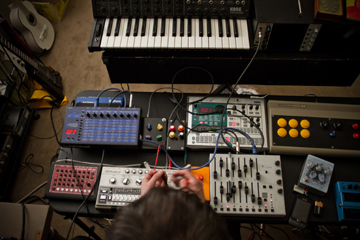 The first-ever Strategy appearance at Mutek is happening in Montreal, May 3. Needless to say I'm amazed, thrilled, and working hard to dial in my performance. 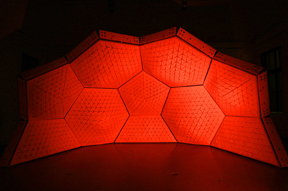 If you are coming to Mutek please drop by. 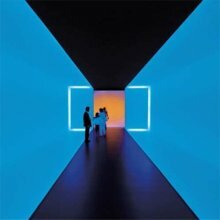 I did a preview mix for Mutek as well. Then later this summer I'm playing at the DATMusic Conference in Missoula, Montana - a town close to my heart as I briefly lived there in 1994 before I moved to Portland. I always loved it and wondered where life would have taken me if I'd stayed. It's been really exciting to see these two projects come to light. "Seeds of Paradise" is an sci fi epic, if you enjoyed Drumsolo's Delight this one is for you. "Pods of Punishment" is the album's evil twin, a more charred industrial take on my sound. I went and toured in the UK and Belgium visiting with the folks from the labels and getting to know their worlds. What an amazing spring. I'm truly grateful. I'm out of copies personally but you can obtain them from the labels directly (linked above). A preorder link is now up for the Noise Tape Self LP on Further Records. Recorded between 2008-2010, this LP contains my tape loop music. Mastered by Pete Swanson and cut at D&M. It releases 3rd week of May. 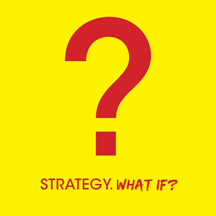 S1 Live: Strategy 6/28/2014 from S1 on Vimeo. This is out now!!! 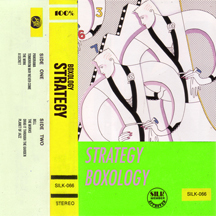 BOXOLOGY! Hear it! Hear more of it! Buy it on tape (limited to 100 copies)! Buy it on digital formats! But for pete's sake just buy a copy, I can barely cover the rent costs ofmy studio. Support the Strategy cause! Be part of the story! I am starting to sound like a Public Radio Pledge Drive!!! ...and a new release coming on Idle Hands. 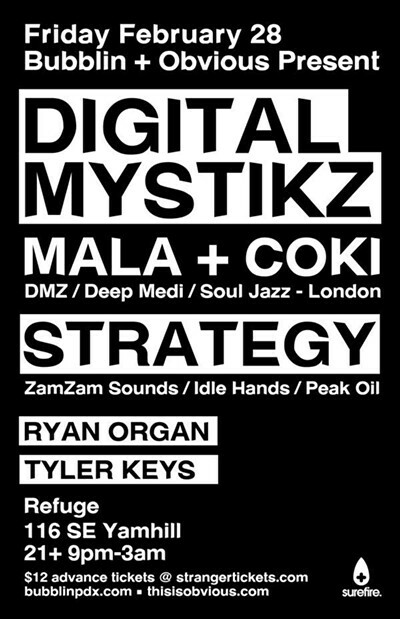 Deepest originals of dubstep (as in the 'original' meaning of the genre) Mala & Coki aka Digital Mystikz will be playing on Refuge's massive system. 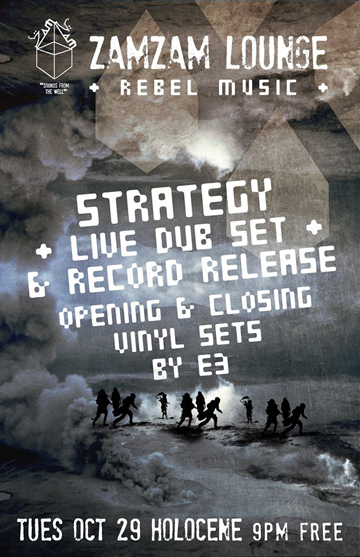 Strategy does direct support DJ set alongside fellow local heroez Ryan and Tyler from Vinylogy. Also if you haven't visited my label's page, Community Library, it has been revamped and a new single by Solenoid, my partner in the label, is for sale there. Last bit of news, a pretty big thing actually: I'll be joining fledgling broadcast and streaming station XRAY FM, as a weekly DJ. My program THE MUSIC HOUR will be a musicological experiment, an hour of exploration of thematically linked music. Also guest appearances and such. Saturday evenings at 6pm. Soft launch (streaming) starts February 5. First of all I just figured out paypal buttons seem not to be working in my shop. Please email me at paul@community-library.net if you want to buy something. Either I'll have to get paypal buttons fixed, or I'll put the stuff on through Bandcamp. Sorry for any inconvenience. Clocky Man / Snow Drift Dub 7"
Zamzam Sounds zamzam14 - available in limited quantities in the shop..otherwise watch for it in finer record shops, pdxindub, or ebreggae.com! Strategy Season 14, Episode 1 SEASON PREMIERE September 11. 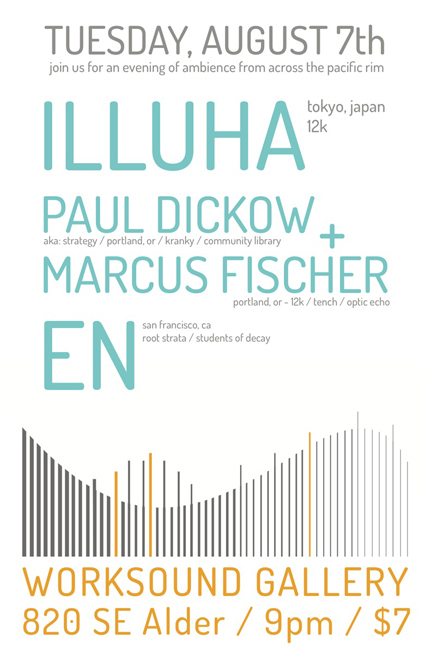 Headlining this show at Holocene hosted by PDneXt. This show will feature all new tracks veering into some mutant bass/garridge/step/deep house/breaks direction. 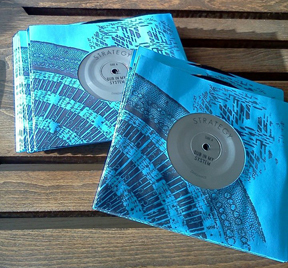 Also, coming this fall, "Clocky Man" / "Snowdrift Dub" 7" coming on ZamZam Sounds. 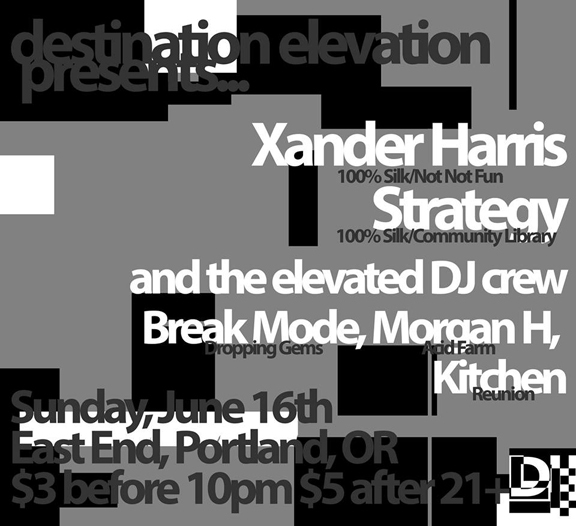 FIRST SHOW of the SUMMER...with Xander Harris, Break Mode, and others at Portland's EAST END. 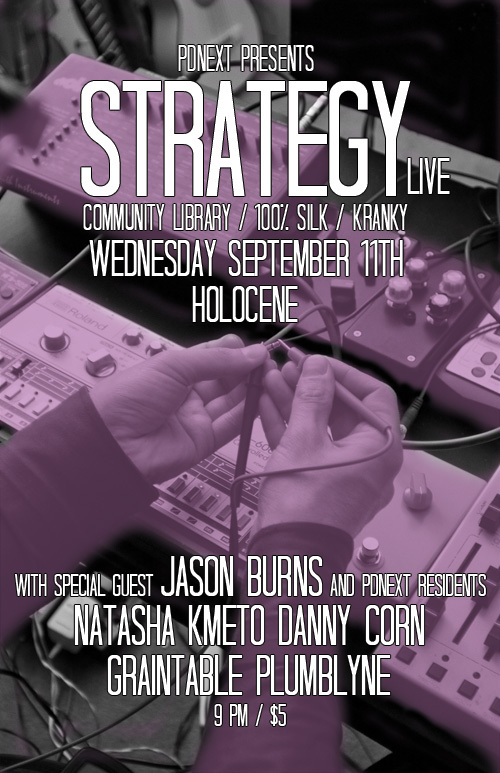 Strategy & DJ Brokenwindow are also DJing for Holocene's 10th Anniversary Party! New releases are being put together now. The first one I can officially tell you about is a followup 7" coming out on Portland's dub label ZAMZAM. If you liked the last one you will not be disappointed! A few shows coming up in Portland and Seattle this spring: an appearance at Mississippi Studio opening for Doldrums, and a spot on the MOTOR bill at Seattle's excellent Debacle festival! 2013 is going to be fun year for Strategy and related projects. If you enjoyed the resurgence in output from Strategy this year there will be more to come in the next months...which will be announced once things are official! See recent postings below for new releases "What If?" and "Luna" that are still fresh. 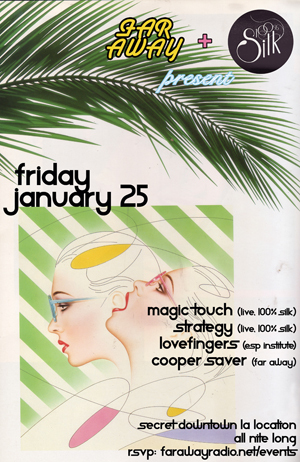 The biggest current news is Strategy shows in Los Angeles, with 100% Silk friends and family. And some nice Portland shows coming up as well. Click "Live" at right for full info. Out end of November, my newest and one of my most EPIC 12" singles ever, "Luna" came out on Endless Flight!! Buy it from Kompakt or Forced Exposure etc! What will happen in 2013? New albums...new 12" singles...remixes...and shows to be announced shortly. 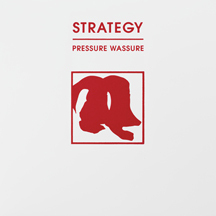 Shop news: I am out of copies of the s/t Strategy LP but buy them from Peak Oil and your favorite shops while you can! it's almost out of print! Live news: Strategy is taking a fall/winter break from live shows thanks to everyone who supported this season of live sets. Back in January, 2012! 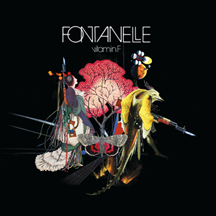 New Fontanelle album, Vitamin F on Southern Lord!- newest work since 2002! 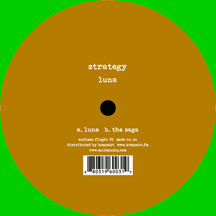 Gritty electric jazz showing a live side of the band that's always been lurking beneath the surface...LIVE SHOWS THIS WEEK... Strategy 12" "Luna" b/w "The Saga" releases October 29 with Endless Flight. So excited to have a return flight on one of my favorite labels. 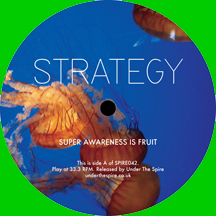 12" and digital to be available at kompakt.fm First "official" Strategy cassette release (and digital), What If? 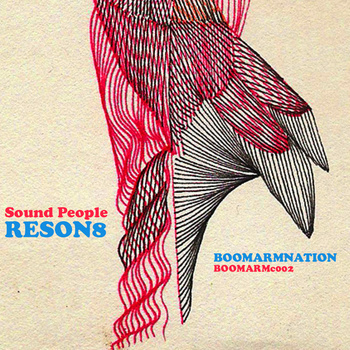 comes out December 5 on Gulls' amazing label Boomarm Nation. If you don't know about it, get familiar now. NEW ALBUM DROPS SEPT. 25 - TODAY! Digital Downloads available at Beatport, Juno, iTunes, etc. 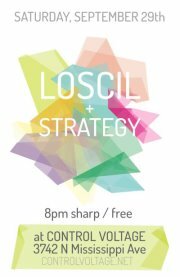 More shows coming up - Sept. 29 with loscil, and more TBA. "Dub in My System" is out now! Stocks are already pretty low. Buy it here or at your favorite local mom and pop record shop! A bunch of shows added here - including a collaboration set with Marcus Fischer (12K), a Strategy appearance at MusicFest Northwest, 100% Silk northwest mini-tour with Strategy, Leech, and Polonaise, and preliminary info for the next SIX event (multi-channel sound showcase). 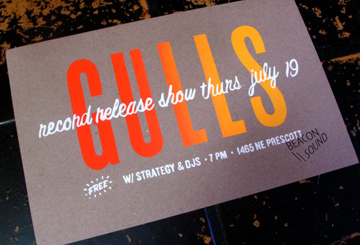 Recent shows have been a big success here's some video of Strategy and Gulls live at Beacon Sound's patio, and here you can find the PRA podcast with Strategy's 2012 PDX Pop Now! performance. ....A few more releases for 2013 are pending and will be announced here shortly! More shows coming including the Gulls release show July 19th at Beacon Sound records and a 100% Silk mini tour. 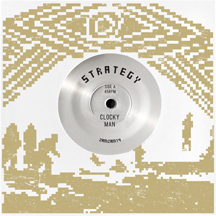 ZAMZAM03 - Strategy "Dub In My System" / "Hardware Dub" 7" Arrives July 31! I will have limited copies available in the shop starting July 31 (and at shows) but you can also get them from the label. Air Texture Volume 2 is a 2-cd set of ambient music, with one CD curated by loscil and the other by Rafael Anton Irisarri. Air Texture label are releasing it July 2 through Kompakt. The previously unreleased Strategy song "Frog City" is included -- very excited to be included amongst a cast of old friends and favorite artists. 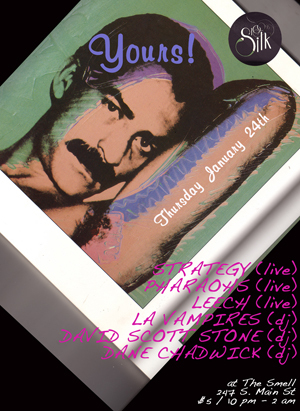 Strategy playing live downtown this weekend at Floating World Comics (more info here)! AND!! 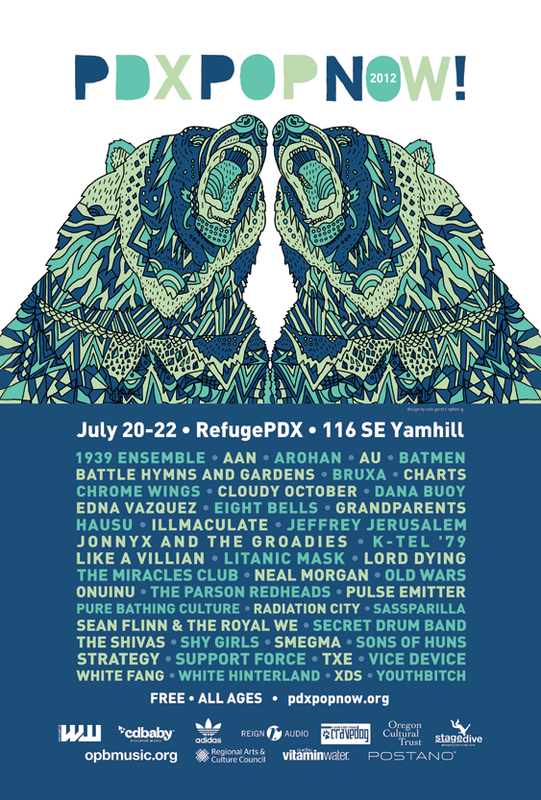 playing at the long-running, FREE and ALL-AGES festival - PDX Pop Now! 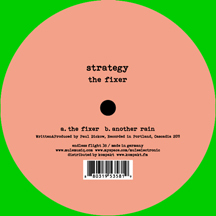 The Strategy 12" EP "Electric Soup" is back in stock in the shop! "Dub In My System" / "Hardware Dub" 7" - Zam Zam Sounds release - end of July! "Frog City" track on Air Texture II compilation CD curated by loscil - July 2! 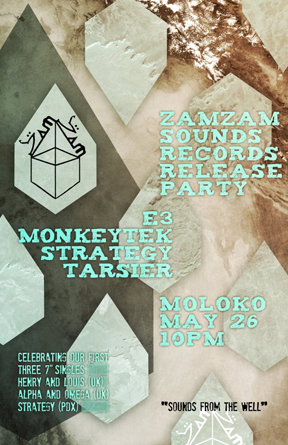 Strategy will be dj'ing a release show for the ZamZam record May 26 at Moloko! OK new website is live! This is the BETA version...Revised layout to come shortly. I've been a little bit scarce around the internet the last couple years, but I'm pleased to have finally launched my own site, finally! Note it's very simple - not much arty crap, just info. New releases are out!! First new Strategy's since 2009. Super proud to be included in the lineups of the fine labels Endless Flight, 100% Silk, and Under The Spire. 100% Silk's boundless enthusiasm is truly infectious so we assembled Boxy Music from slabs of raw techno that are perfectly suited to the current west coast deep-underground-dance feelings going on right now. Bollywood tape sample stabs meet up with goofballed dub techno, jacking synth tracks inspired by UK "bleep" techno, jazzed up organ house and some gnarly ring modulators are mixed in too. 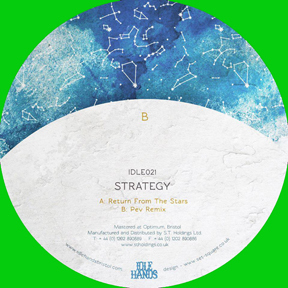 If you came looking for delicious chord stabs and cascading echoes, maybe some dub basslines you'll find those of course.BUY HERE. Video for the release!! 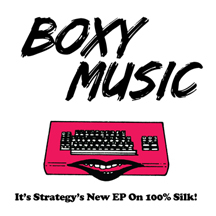 STRATEGY - BOLLY VALVE 2000 teaser from 100% Silk on Vimeo. "The Fixer" is one of my most slamming dance tracks so far, and melds some vintage 80ies feelings with jacking house rhythms, synth chimes and futuristic dubouts. "Another Rain" is more like a polyrhythmic deep house journey that blooms into Bohannon-inspired syncopated guitar funk. You can buy it at Kompakt, Forced Exposure, Juno, and many others. So honored to be represented on one of my favorite current dance labels. As probably the more technoid representative on UTS, it's got all the echo and noise those fans might expect plus a big helping of bass drops and pulse. I've been telling people this is like Chain Reaction era dub techno with a messy free jazz tendency. Decide for yourself by ordering from Under the Spire. Super thanks to UTS for bringing me back for this one-- my second release for them.